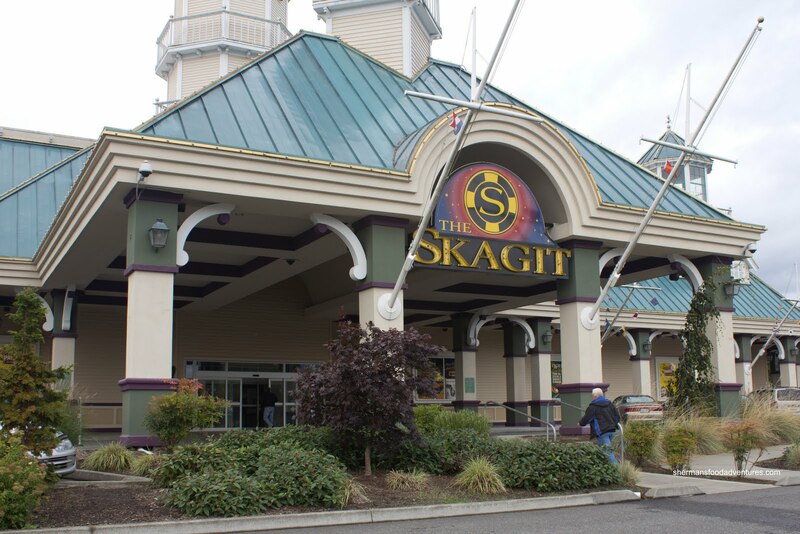 Ever since The Outlets in Burlington has arisen from the dead, we have paid fewer visits to The Premium Outlets in Tulalip. 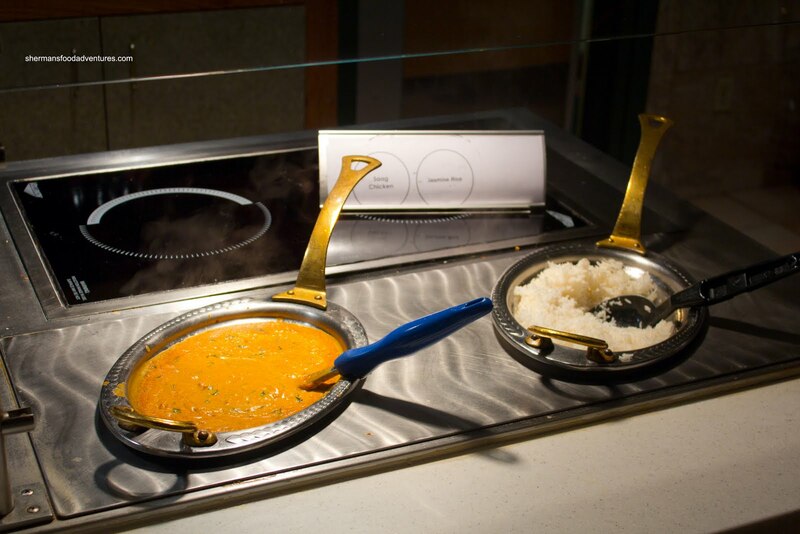 However, much like Tulalip, Burlington and nearby Mount Vernon are not exactly hotbeds of culinary excitement. Hence, our expectations are never really that high. 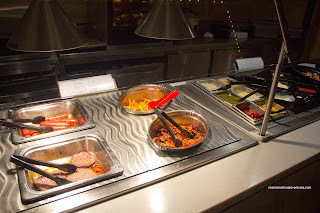 That is the case with the Eagles Buffet in the Tulalip Casino. The food really ain't that good, but considering the price and location, it more than does the job. For those who balk at the stuff there, trust me, I know that the Chinese food is laughable and yes, I also know that most of the food is cooked beyond recognition. 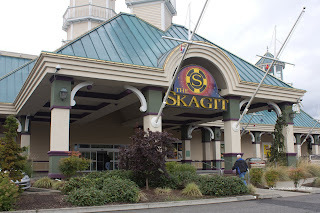 Again, we need reasonable expectations... Then you could fully understand our thought process behind trying out the other casino buffet at The Skagit. Besides, don't they specialize in buffets in the USA anyways? 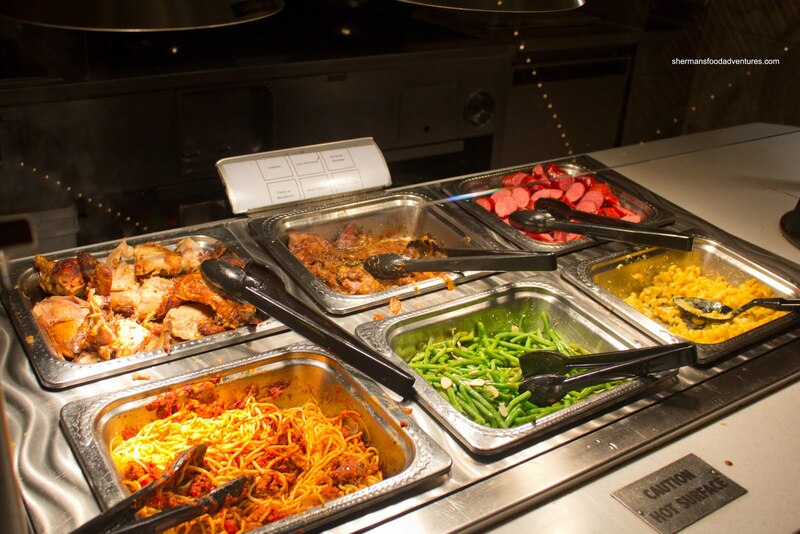 Market Buffet, which is located in the casino, is only short drive up the I-5 from Burlington. So this was to be our "interesting" lunch. Now interesting doesn't necessarily mean good though. But $9.95 for the lunch buffet, we weren't holding out for too much. Thank goodness our expectations were reasonable because a lot of the stuff looked quite suspect. 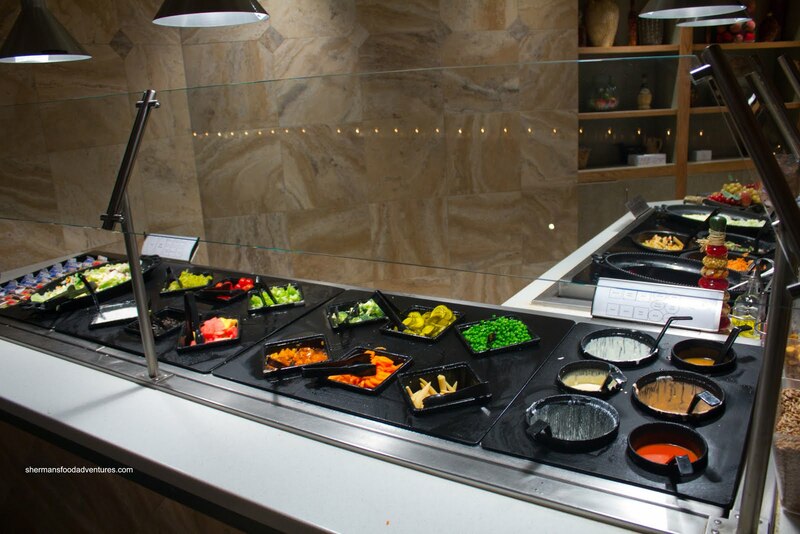 We did start with the Salad Bar first and it was pretty basic. The veggies were good though, so not much to complain about. However, the prepared salads were another story. I found that they were far too sweet. The carrot salad especially since it tasted like marshmallows. Directly adjacent to the salad bar was a selection of soups and a completely random offering of Saag Chicken with rice. 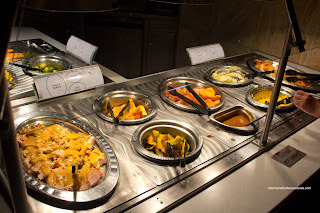 Now I completely understand the meaning of a buffet, especially one that caters to a wide range of diners. So when the Saag Chicken was blander than plain tofu and didn't resemble saag in appearance either, it was understandable. Now understandable is one thing, but the fact that it wasn't very good is another. For me, it seemed like they tried to make butter chicken, failed, then added some chopped spinach after the fact. Making a right turn to the next section, we found a mishmash of stuff which included Burgers, Hot Dogs, Fries and BBQ Pulled Pork. We didn't go for the burgers nor the hot dogs because the kiddies weren't with us and frankly, those are filler items. Granted, some people like hamburgers and hot dogs, so that is only a personal opinion. As for the pulled pork, it actually had a nice meaty consistency and was only marginally dry. The sauce was not very good though, it was a cross between marmalade and candied BBQ sauce. The fries reminded us of the ones found at Costco, which incidentally is not necessarily a bad thing. 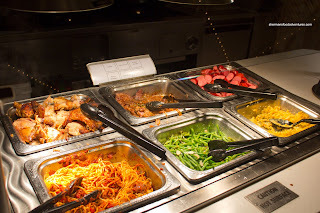 Taking a turn towards the main hot food sections, we found a variety of items including Roasted Chicken, Liver & Onions, Smoked Sausage, Spaghetti, Green Beans and Mac 'n Cheese. Surprisingly, the chicken wasn't half-bad. Granted, I took the drumstick which would naturally be more moist and flavourful, but give it to them that it was so. The liver was overcooked and really, this was expected. The one thing that was kinda gross was that the flour coating was separating from the liver and making a goopy mess. Viv hated the sausages, they were too salty. Um... I'm gonna refrain from making a joke here in fears of Viv reading this... So... the Spaghetti was still toothsome, but not really due to the cooking, rather, it looked to be sitting there for awhile. Furthermore, there was not enough sauce to keep it hydrated. The green beans were okay, not terribly overcooked and they were seasoned. Mac 'n Cheese wasn't very cheesy nor was there enough sauce. 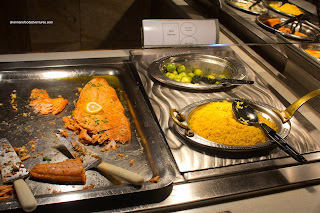 Right next door to this selection of food was Salmon, Brussel Sprouts and Rice. 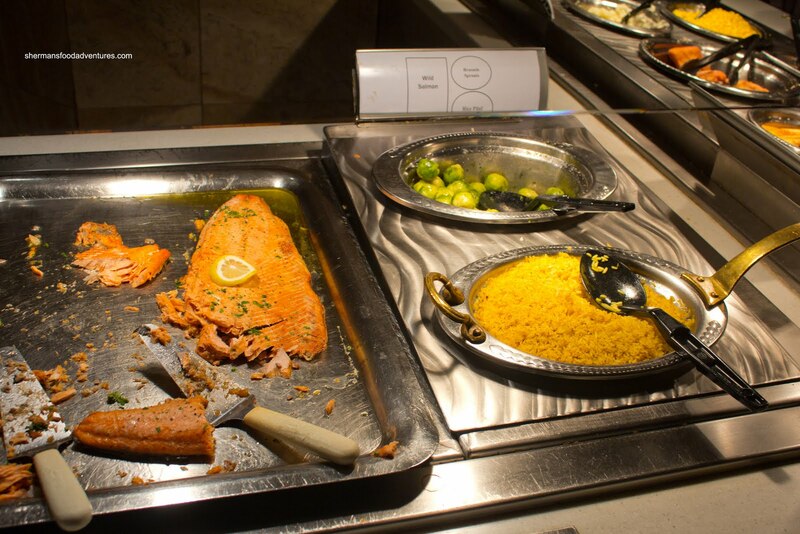 Salmon was dry, but acceptable, while the rice was hard and dry. The brussel sprouts? They were brussel sprout. Enuff said. The last of the hot food consisted of Turkey with stuffing and gravy, Garlic Bread, Acorn Squash, Bannock, Gravy, Corn, Mashed Potatoes and Pork Tenderloin. Despite its messy appearance, the turkey mixed with the stuffing and gravy was actually not bad. Other than the gravy being too salty, the turkey was not too dry. I liked the bannock, but didn't eat too much since it was filling. We really didn't care for the pork, it was super dry and the sauce was sweet as candy. In the center of the buffet was the Dessert Section which included a decent selection of sweets. Nothing really stood out and by then, I was not motivated to eat anymore. In summation, Market Buffet serves only one purpose and that is to provide food for people who don't really care about taste or execution. i live for buffets. 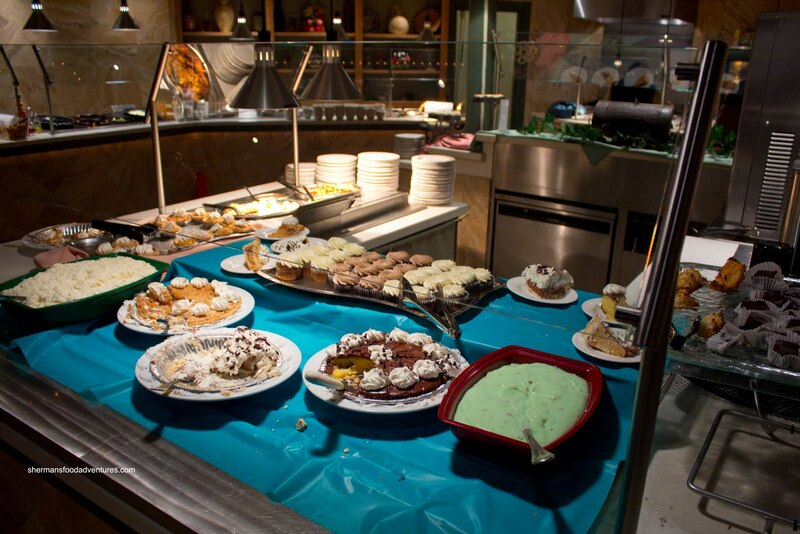 in edmonton (well enoch, alberta which is a 2 minute drive outside the city limits) theres a casino buffet. I've had it a few times-its good. All you can eat - New York Stiploin on tuesdays. The also have prime rib 2 nights a week. They got real ceasar salad you add your own bacon bits and parm, baked potatos, tons of other things to choose, desert and drinks included for $18. @McRichard Well, if you got AYCE striploin, that sounds better than what I had!